Our annual Spring Flower Walk was held on Meadowridge Common on Saturday 20 September 2014.
and Olwen Gibson, a retired teacher and Kirstenbosch tour guide. and faunal - treasures to be found on the Common. 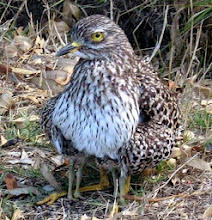 The 'flagship species' of the Common is the Rare and Endangered Cape Flats Silkypuff (Diastella proteoides). Second from the right is Fiona Watson, the Botanical Officer of the Friends of Meadowridge Common. 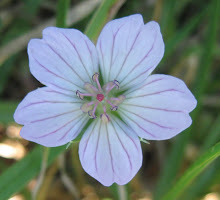 Fiona has listed most of the species that occur on the common, and has extensively researched the botanical history of the area, which is a very small remnant of Frederick Purcell's original farm, Bergvliet. Opening in the midday sun, a flower of Trachyandra revoluta. and a look at what is growng in the rehabilitated wetland area. and a healthy, flowering Struthiola dodecandra bush. 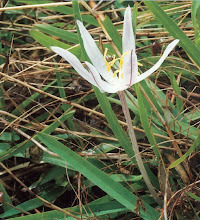 and a paler version of Romulea hirsuta. Many of the flowers are not welcome - as is this alien legume, Narrowleaf Clover (Trifolium angustifolium var. angustifoliuma). 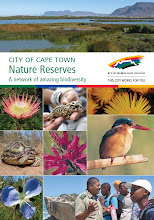 In the centre is Fay Howa, City of Cape Town's Conservation Officer in charge of the common. 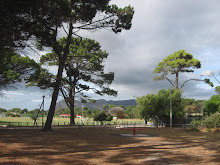 The Cluster Spiderhead (Serruria glomerata) is endemic to the Cape Peninsula and the plants on the common were propagated from plants on Kenilworth Racecourse and planted here, as according to Purcell's list of plants on Bergvliet Farm, they once occurred here. Lampranthus glaucus on the edge of the wetland area. These were also planted here from cuttings taken from Kenilworth Racecourse. Another alien weed from the Mediterranean, said to have come to South Africa in horsefeed, the Blue Lupin (Lupinus angustifolius). The sedge Pycreus polystachyos var. polystachyos making patterns on the edge of the wetland area. Next to the wetland area is this huge web made by the Community Nest Spider (Stegodyphus dumicola). I don't know if the members of the Meadowridge Football Club realize what a special place they play on each weekend. 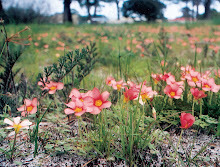 Even the much-used fields are ablaze with Cape Weed (Arctotheca calendula), Rooiknikkertjies (Romulea rosea) and many other flowers. Perhaps one day surrounding residents will learn to treasure it for what it is, as well as for what it affords them in the way of recreation. Click here for information on what flowers you may see on the Common during September.